Silly Bee's Chickadees: Go Red for Women! 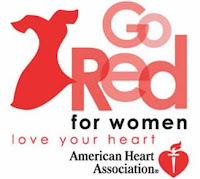 Tomorrow, Feb. 6th, is Go Red for Women Day sponsored by the American Heart Association. Go Red for Women is a national campaign to raise awareness for coronary heart disease and stroke among women. Click on the logo above for more information. They also have a Spanish site at www.goredcorazon.org. Go to their Go Red for Women web site and sign up to access great heart health resources as well as Heart-Healthy Recipes complete with nutritional guides. 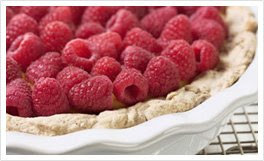 This "featured" recipe, Berry Topped Pudding Pie, grabbed my attention big time! To quote Rachel Ray, "yummo!" Click on the photo above for the recipe. Go Red for Women also has a great online boutique. Check out their goodies by clicking on the logo above. They have everything from jewelry and ties to cookbooks and Christmas ornaments. Campbell's Soup asked fashion designer Nicole Miller to create three dresses for American Heart Month. Click on the logo above to vote online for your favorite dress and each vote through March 2 will generate $1 to the Go Red campaign. The winning dress will be worn by Jane Krakowski, of the hilarious tv show 30 Rock, at an American Heart Month event. Such a fun way to contribute with just one click! Macy's is a national sponsor of Go Red for Women and in honor of the event, they're offering a 5-day sale! Wear red to any Macy's store and "get an extra 20% off most regular, sale and clearance purchases". Make sure you ask before you check out to make sure your purchase qualifies. Some name brands like Coach and Ed Hardy don't apply. They will also be selling Red Dress Pins for $2 and donating all proceeds to the American Heart Association's Go Red for Women movement. 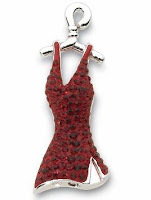 Swarovski has a number of Go Red items on its website including this beautiful red dress brooch. They have pledged to donate $150,000 to the Go Red movement. Click the image above to go to their site, then type in "go red" to see all their red blingy yummies. 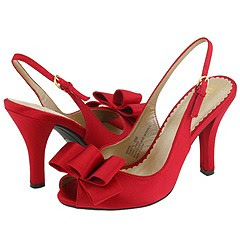 Don't forget to wear your red on Friday, it's a great day to show off those hot red pumps! Oops! I finally posted it after midnight last night, so I thought my "tomorrow" would be on Friday! I started writing it in the afternoon, so I guess that's why it says Wednesday. Soooooo, you can still wear red tomorrow!